This review does not contain spoilers from “Fast Five,” which I highly recommend you rent first. Also, please excuse me for any automobile-related puns. 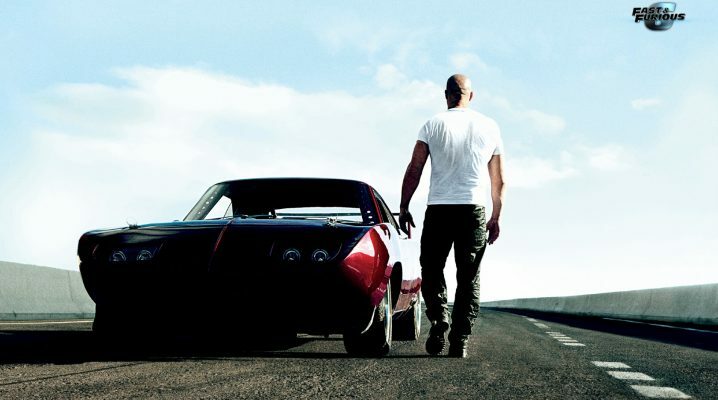 “Fast & Furious 6” requires your suspension of disbelief, not your analysis. 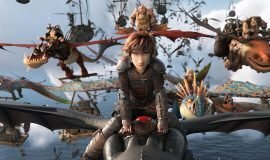 It’s an exercise in sheer spectacle, bigger and badder than the last film. Sure, it’s everything a summer blockbuster should be. And as pure escapism, it doesn’t burden the audience with much thought. But, with the series having waved bye-bye to “street legal” in order to deal with much bigger problems, it risks over-extension while reaching for some of those insanely ambitious moments, achieving John Woo levels of pageantry in the process. Even though there’s a hint at the end credits, you’ll wonder how much further this thing could possibly stretch for next year’s “FF7”. While this overstimulated behemoth doesn’t have quite the impact of 2011’s focus-shifting “Fast Five”, which so far is the best in the series, it’s not for lack of creativity. “Five” was an unexpected gem, a solid action film that was a massive improvement for the stalling street racing franchise. 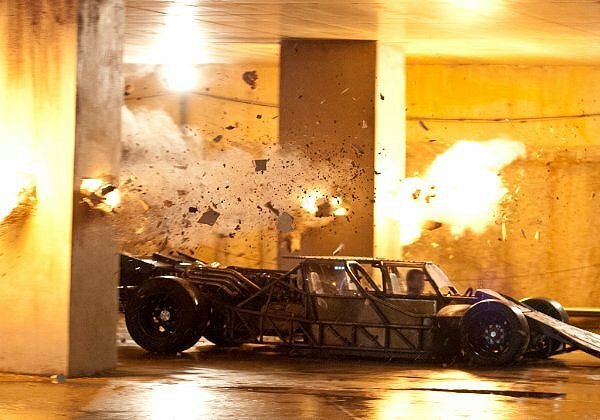 For “Furious 6”, his fourth go at the series, director Justin Lin doesn’t let the overhaul go to waste – logic and physics don’t get in the way of some pretty spectacular car chases, some of which are jaw dropping even by today’s standards (one including a cargo plane). With the additions of MMA star Gina Carano (“Haywire”) and Joe Taslim (“The Raid: Redemption”), even the fight sequences have been raised to a more acrobatic level. And, like anyone buying a ticket to this film might expect, there’s very little else to cleve the typically bad dialogue and racing metaphors. The story is as cookie cutter as it gets, a basic framework for staging big action sequences while the recurrent clichés remind us about family, honor and so on. Picking up only months after the events of “Fast Five”, we find DSS Agent Hobbs (franchise savior Dwayne Johnson) asking retired criminals Dominic Toretto (Vin Diesel)and Brian O’Conner (Paul Walker) to get the band back together and help him track down a British special forces soldier-turned criminal mastermind named Shaw (Luke Evans) who’s caused an international stir while stealing the components to a high-tech weapon (some variation of Goldeneye, I think). 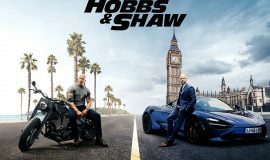 Hobbs coerces Toretto and O’Conner out of their non-extradition paradise with evidence that Letty (Michelle Rodriquez), the love of Dom’s life (who was thought to have been killed two films back), may still be alive and running with Shaw’s gang (the reason is ridiculous, just go with it). 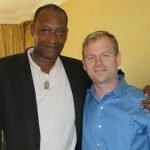 So, after being promised full amnesty for their cooperation, they wrangle the crew, get some cars, and head into a situation that’s best described by gadget guru Tej (Chris ‘Ludacris’ Bridges) as “vehicular warfare.” And that’s an understatement. The most impressive scenes, like in “Fast Five”, are loaded with practical effects. In particular, a fifteen-minute sequence in which Shaw’s tank barrels down the freeway destroying more vehicles than in the five previous films combined makes the movie a worthwhile watch all by itself. Like a 12-year-old with his mother’s credit card, Lin goes nuts with the budget, up-shifting things into full-blown militarized mayhem as bridges collapse and vehicles are sent airborne like tiny flying fish. It’s difficult to calculate the collateral damage, which is comprised mostly of law enforcement and innocent civilians, but Dom’s brilliant late-in-the game notion of “Try to distract him from the people” amidst cannon fire and crumbling rock should allay any doubt that the primary characters are at least semi-conscious of the body count. I guess if we’re supposed to “check our brains at the door”, we shouldn’t be too concerned with such things anyway. 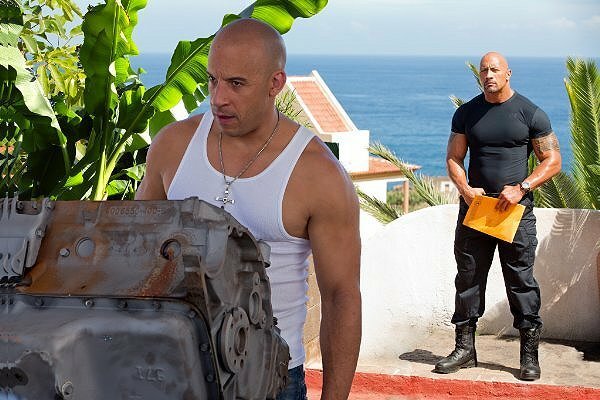 There’s not much in the way of character development – that ship has sailed, and with several newbies there are almost too many to keep track of anyway – but each of the returning characters from “Fast Five” at least has something relatively interesting to do. If you’ve seen the other “F&F” films and you’re not expecting some kind of moral epiphany, this shouldn’t be too hard to enjoy, and you’ll be glad that it doesn’t waste time with unnecessary fluff. It makes the same mistakes as most action sequels that become muddled in overblown CGI (the climax here makes the final sequence in “Con Air” look understated), but Lin deserves kudos for coming up with some new and explosive concepts. One way or another, it’ll do a number on your equilibrium. 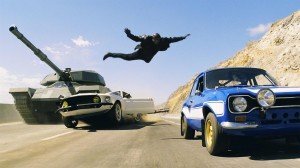 As preposterous as its reasons are, “Furious 6” does a good job at tying all six films together (even 2006’s seemingly unrelated “Tokyo Drift”) while opening an immediate door to “FF7″, which is slated for release in July 2014. 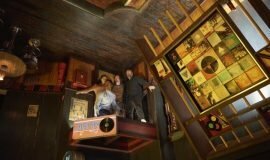 The London locale is a nice change, even when things get a little incoherent. If the franchise continues at this pace, we might be watching Toretto and company piloting some top secret NASA mission to save Earth. Seriously, it’s not much of a stretch.